There’s a little, traditional-looking restaurant on rue Keller in Paris that’s not what it seems. It isn’t a bistro as such … there’s no fairly predictable list of French classics washed down with red wine, nor is it an ultra-modern temple of haute cuisine. Instead, it serves a menu based around minced meat, formed into tartare, burgers or meatballs. The three friends behind Cafe Moderne – one a very handy chef, the other two addicted to street food – realised on a jaunt around New York that there’s more to the meatball than the grey and unappetising ones from that ubiquitous Swedish furniture store, the one where you always mentally factor in a second trip to return the stuff that just falls apart, or the burgers from that temple to Americanism, the one with the drive-thru golden arches. They were right. At their best, a burger or meatball can be sublime – a carefully seasoned, carefully flavoured dish centred around either can change the course of your day. It’s simple food, but when it’s done well, it’s got the potential to be astonishing food. 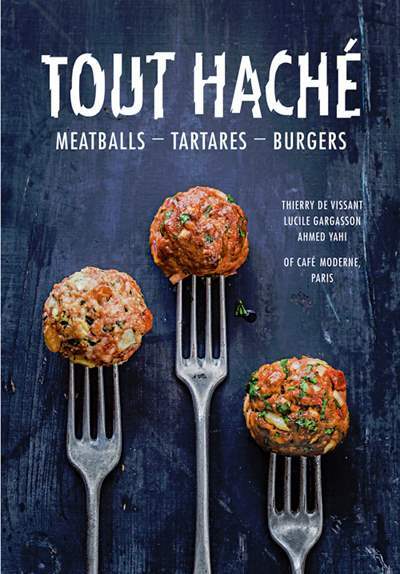 So, here’s a cookbook – Tout Hache – that collects together the things that these three Frenchmen learned on their journey of minced meat related rediscovery. There’s lots to go at – meatballs wrapped in crushed hazelnuts, stuffed with chorizo made from chicken and packed with Deep South spices, cod balls bound with coconut milk, a tartare cut with beetroot for a beautiful purple finish, and burgers in all their considerable glory. Tartares and ceviche round out the Holy Trinity, with various ways with raw beef and fish, just tinged with the acid of lemon or lime, cooked but not. This is a great little collection of recipes and ideas to lift something quite humble to another level. Yes, this sort of food is all the rage at the moment, riding on the edge of the street food revolution, but that’s no bad thing – it’s popular because it’s good to eat. Smash that popularity together with a group of French blokes who clearly know what they’re on about, write it all down, and this is what you get.